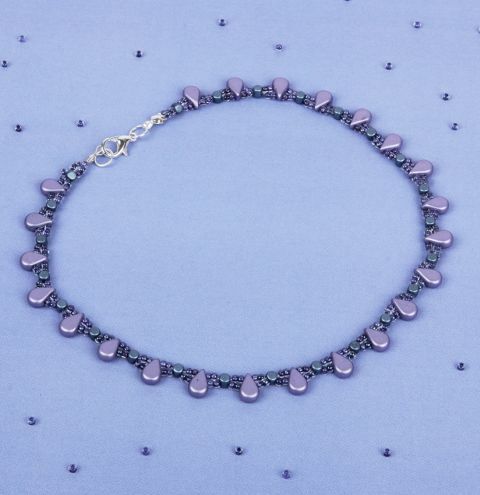 Use the latest 'Minos' and and 'Amos' beads from the Par Puca range to make a pretty necklace in Pantone's trending Colour of the Year 2018 'Ultra Violet'. If you're new to beading with shaped glass beads, you'll find this pattern very easy to follow! Cut an arm span of thread, thread a needle on the end. Thread on a calotte and crimp bead to the centre of your thread. Pass the needle back through the calotte, missing the crimp bead. Squash the crimp bead flat with your pliers and close the calotte around it. Now attach another needle to the other thread as you will be using both. Pass both needles through one seed bead in the same direction. Now on both needles, thread on two seed beads and pass both needles through 1 Par Puca Minos bead. Add two seed beads again to each side and pass both needles through a Par Puca Amos. Repeat your pattern, alternating between two seed beads (on each side) Par Puca Amos. and then 2 seed beads, Par Puca Minos until you have reached your desired length. To finish the end, after you exit a Par Puca Minos bead, add two seed beads on each side then go pass both needles through one seed bead. Similar to step one, string on a calotte and crimp bead on one of your threads. Pass the needle back through the calotte (missing the crimp bead) and back through the design. Take the other needle through the calotte and crimp bead and back through the calotte and into the opposite side of seed beads. Pull the threads carefully to position the calotte close to the end of your beadwork. Squash the crimp bead with your pliers and close the calotte over it.